Have you tried the Family Keylogger before? If yes, please consider recommending it by clicking the Facebook "Recommend" button! This download is 100% clean of viruses. It was tested with 26 different antivirus and anti-malware programs and was clean 100% of the time. View the full Family Keylogger virus and malware test. The file that was tested: fkl-setup.zip. Tip: If you're experiencing trouble downloading this file, please disable any download managers to family keylogger you may be using. If you're receiving a 404 File Not Found error, this means the publisher has taken the file offline and has not updated their links with us for Family Keylogger. Please do drop us a note in the event of a missing file. Spyarsenal provides you with a WinZip/SevenZip Archive file. Installing from Zip files is easy and can usually be done by double clicking the EXE file in the archive with programs like WinZip or Seven Zip. Alternatively, you can extract the setup and installation files to a directory of your choice and run them from there. Keyloggers - Protect your family with Golden Keylogger, the only family-friendly keylogger. Keyloggers - OsMonitor is powerful employee monitoring software available for company in Lan. 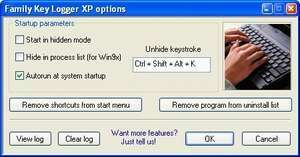 Keyloggers - Invisible keystrokes recorder. Record, collect, view information typed on PC. Keyloggers - KGB Spy Software is a multifunctional keyboard tracking software (a.k.a. key logger) that is widely used by both regular users and IT security specialists. The reason for such popularity is that this program does not just record keystrokes; it is capable of recording language specific characters (ex. umlauts), date and time certain window was initiated as well as the caption of that window.